My first bowl of ramen since living in Japan came at Takumiya so I do have a soft spot for it even though I have since discovered it doesn't really match the quality of other ramen stores in Japan. When walking by on a cold winter's day, Takumiya draws you in with the strong smell of ramen emanating from the vents, and the foggy glass door gives you a warm, cozy feeling. Takumiya doesn't appear to specialise in one particular ramen and offers shoyu, miso and shio varieties. I opted for the shoyu on the slightly different ticket machine which which allows you to punch in your order on a small electronic keypad which corresponds to the numbered menu to the left. However, once I had ordered, I noticed that the tsukemen appeared to be the most popular amongst the clientele. I had already opted for the shouyu ramen since it appeared at the top of the list so I assumed it would be the stores recommendation, although I cannot confirm this. The shoyu was pretty reasonable. The chashu was pretty standard - nothing to write about, yet here I am writing about it - but I feel that one slice probably isn't enough to justify the ￥750 price tag. Back in the days of this being my regular haunt after a long day at work, the chef would often add a second slice, but I don't think he remembered me this time. The noodles were thin, (not as thin as Hakata ramen) and at one point were tangled which left the centre area of the knot a little undercooked. I didn't drink all of the soup which was a little bitter and I had to leave some room to finish my bottle of beer. 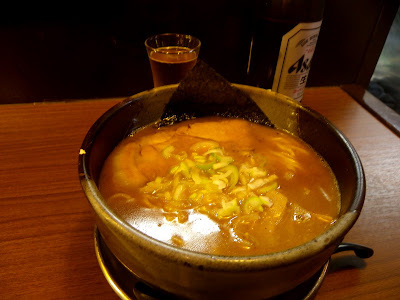 If you're in the area on a cold winter's night in need of some warming up Takumiya will definitely fulfil your needs, however Minowa is not the most convenient place and it probably isn't worth a trip out there just for this place.